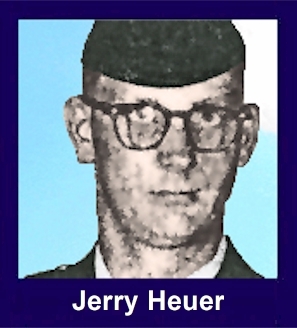 The 35th Infantry Regiment Association salutes our fallen brother, PFC Jerry Wayne Heuer, who died in the service of his country on April 15th, 1968 in Kontum Province, Vietnam. The cause of death was listed as Multi-Frag. At the time of his death Jerry was 21 years of age. He was from Sparta, Wisconsin. Jerry is honored on the Vietnam Veterans Memorial at Panel 50E, Line 4. The decorations earned by PFC Jerry Wayne Heuer include: the Combat Infantryman Badge, the Purple Heart, the National Defense Service Medal, the Vietnam Service Medal, the Vietnam Campaign Medal and the Vietnam Cross of Gallantry with Palm Unit Citation. The Vietnam War has claimed the life of another Sparta area youth. The victim was PFC Jerry Wayne Heuer, 21, son af Mr. and Mrs. George Heuer, Rt. 3. He had been in Vietnam only two weeks. Heuer was the oldest in a family of ten children. He was a 1964 graduate of Sparta Senior High. After graduating from high school, he worked on his father's farm and also as an employee of the Milwaukee railroad before entering the army. Surviving are his parents, six sisters, and three brothers, all at home. The sisters are: Betty, Helen, Joyce, Kathie, Janis, and Julie. Brothers are David, Roger, and Kevin. Jerry is buried in the Leon Cemetery, Leon WI.